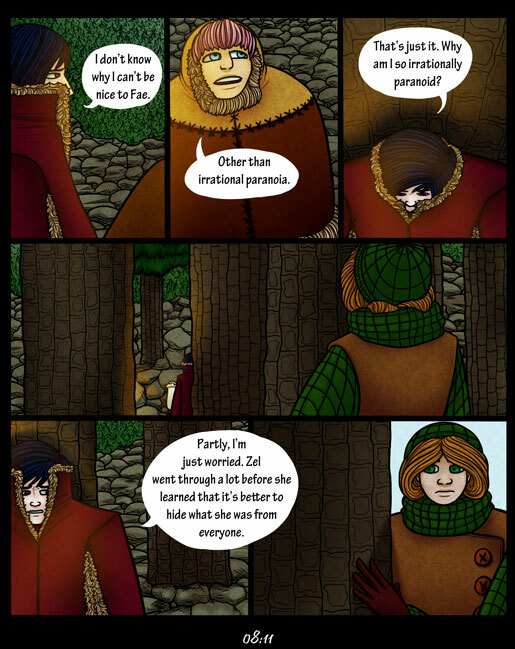 Originally, I was going to have a panel on this page where Enya recognized Fae had returned and then decided against it since as much as Enya can direct a conversation so that a third party will over hear the relevant parts, she isn't doing that here. Fae wondered back early because she's getting cold and noticed that the fire had been started. Also, it's about to get dark and with how rocky the terrain is Fae doesn't want to wonder back to camp without being able to see where she is going. Neither Enya nor Adrik expected Fae to turn back so early as they aren't hindered by the same realities of physical existence as Fae. Enya can generate her own light and Adrik doesn't have to walk (doesn't need light to "see" either but that's a topic for next chapter) and so this is just another instance where they forgot about Fae's limitations. Although if it weren't for Fae neither of them would have had the sense to get warm clothes until someone took the wrong sort of interest in two people not dressing appropriately for the weather.